Mercedes-Benz wants to honor you and your car. Mercedes prides itself on producing cars that are capable of galactic mileage sometimes rivaling that of Apollo era spacecraft. The engineers work extremely hard to ensure that with only basic maintenance these cars are just getting started when others are starting to pack up. But you already know that. Currently the highest mileage Mercedes is owned by Gregorios Sachinidis, a Greek taxi driver. His 1976 240D has now past 2.8 million miles. More than 11 times the distance to the moon. The Koschels in California have a 1970 280SE, the car has exceeded 1 million miles. You don’t need to hit these numbers for Mercedes to honor your achievement. 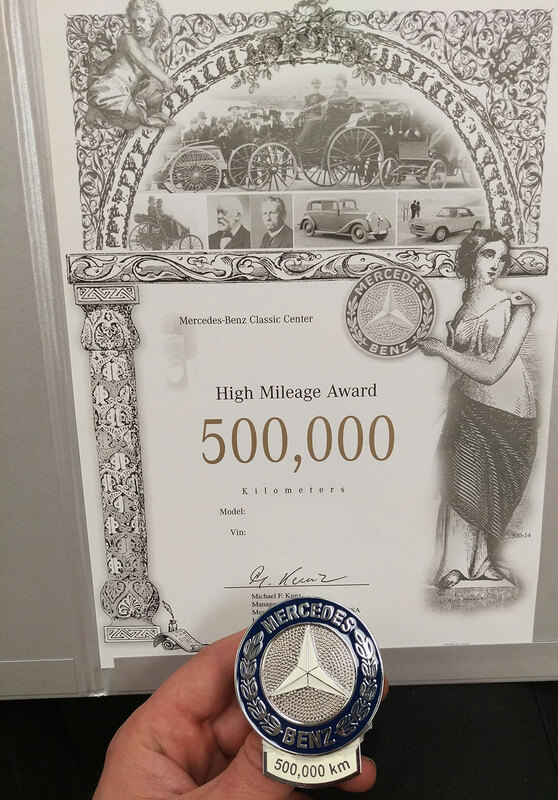 Since the 1960s Mercedes has been awarding owners for their mileage accomplishments. When you achieve one of these milestones Mercedes-Benz will reward you with a personalized certificate and awesome metal grille badge certifying the event. The process is pretty simple. All you need to do is fill out this form. Bring it to your local dealership along with your car so the mileage can be verified. Send the completed form off to MBUSA and within 8 weeks your award will arrive. Like happy meal toys, collect them all! Being a Swiss National, Mercedes -Benz stands for “number One” in the High Quality cars globally! I myself have been driving an old Mercedes-Benz for many, many years!